I recently received during a ST training day a sample of the X-NUCLEO-IDB04A1 shield. This shield is based on the BlueNRG network processor from ST and it allows to create Bluetooth Low Energy (BLE) applications using an Arduino compatible developing board. 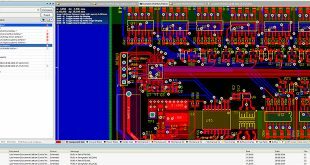 Obviously, ST designed the software for this shield to be used mainly with its Nucleo range of developing boards. 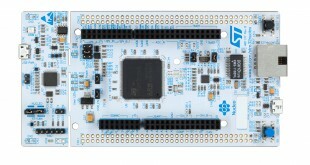 In fact, all necessary libraries and examples needed to use this shield are designed to run on Nucleo-L0 and Nucleo-F4 boards using their respective HAL. However, ST still doesn't provide official support to free GCC/Eclipse toolchains (an this is a pity...), and it's a little bit tricky to use ST demo files and BlueNRG HAL without using a commercial IDE supported by ST (IAR, TrueSTUDIO, etc). In this post I'll show you how to use the free GCC/Eclipse toolchain we've setup in the past to compile BlueNRG stack and demos. I'll show you all the required steps to successfully compile and run one of the three demos made by ST. ST provides also an App for Android and iOS platforms that interacts with this shield. At the end of this tutorial we'll be able to use this App to interact with your Nucleo and X-NUCLEO-IDB04A1 shield. However, I've to clarify that it's out of the scope of this post to explain how the code works in depth. I'll cover these aspects in the future. 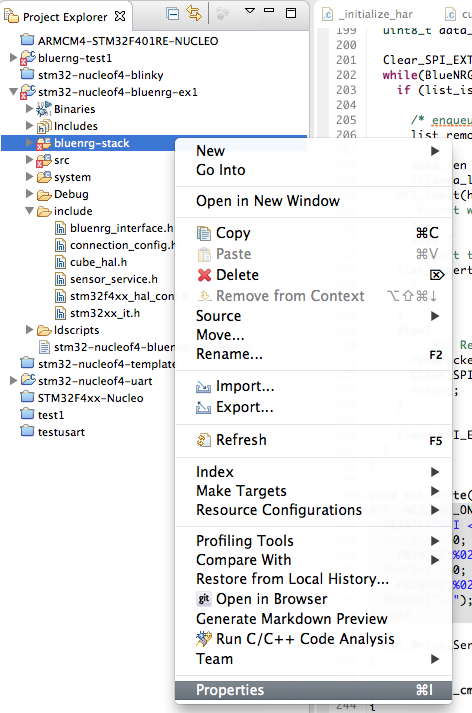 In this post we'll see how to correctly import the BlueNRG stack in the Eclipse CDT IDE and successfully compile it. Which is, believe me, a not trivial task if you are totally new to the STM32 developing process. Before we start playing with this shield, let me spend two words about BlueNRG chip. BlueNRG is a monolithic network processors made by a Cortex-M0 core plus a radio transceiver able to work ad 2.4GHZ frequency. It just requires few other external components to properly match the antenna section, and it's pre-flashed by ST with a Bluetooth 4.0 Low Energy (BLE) compatible stack. This means that all the necessary code to build BLE application is already implemented in the chip and you don't need to take care about how this is made, configured and optimized (you can trust me when I say that this is a really fundamental thing 🙂 ). 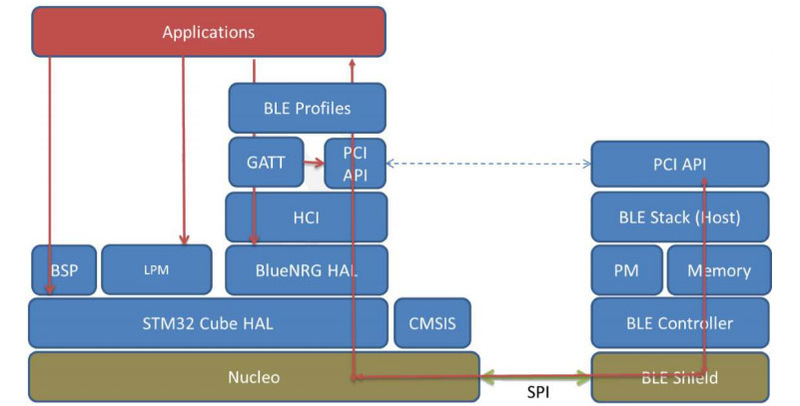 The user application has to be implemented inside another external µC. Since the whole networks stack is implemented in another chip, we can use one of the STM32 µC from the value line F0 catalog. This means that you can use a chip that costs less than €0.50 to crate a complete BLE application, with a total cost less than €3.00/1000pcs. This a really interesting target price, according to me. 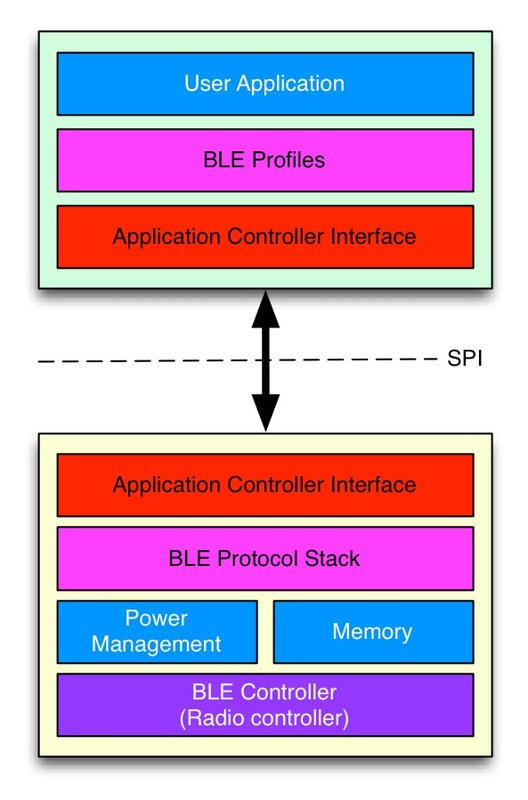 BlueNRG interacts with user application in the external µC through the SPI interface. ST has developed an Application Controller Interface (ACI) - a sort of API build upon the SPI interface - that allows developers to interact with the chip without knowing implementation details of the BLE protocol stack. To simplify the development process, ST gives a free and complete set of libraries, which in turn are based on the STM32Cube-Fx framework. This set is called X-CUBE-BLE1. 4 different demo projects to test different capabilities of BlueNRG chip; demos are built on STM32 Nucleo boards and X-NUCLEO-IDB04A1 shield. 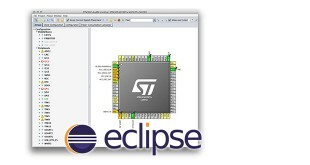 A complete and working GCC/Eclipse toolchain for STM32 based on the GNU ARM Eclipse plug-in, as described in this series. A STM32-Nucleo-F401RE developing board (it should be not too much complicated to rearrange instructions for your specific Nucleo). A X-NUCLEO-IDB04A1 Arduino compatible shield. The first step we need to do is to create a project using the GCC ARM Eclipse plug-in. You can use the project name you want, but pay attention to use the following settings during project generation. Don't forget to enable ARM Semihosting, since the sample app from ST uses extensively semihosting to print debug messages. I'll show you next how to disable it to use the example application even without a debug session (when semihosting is enabled, the firmware hangs if it doesn't run during a debugging session, since the print() function expects a valid connection to OpenOCD to print messages on its console). Ok. Let Eclipse to generate the test project, and download the X-CUBE-BLE1 software package from this page (see the bottom of the page for download link). By default, I'll assume that the software package is extracted in the C:\STM32Toolchain directory, but feel free to place it where you've configured your toolchain. 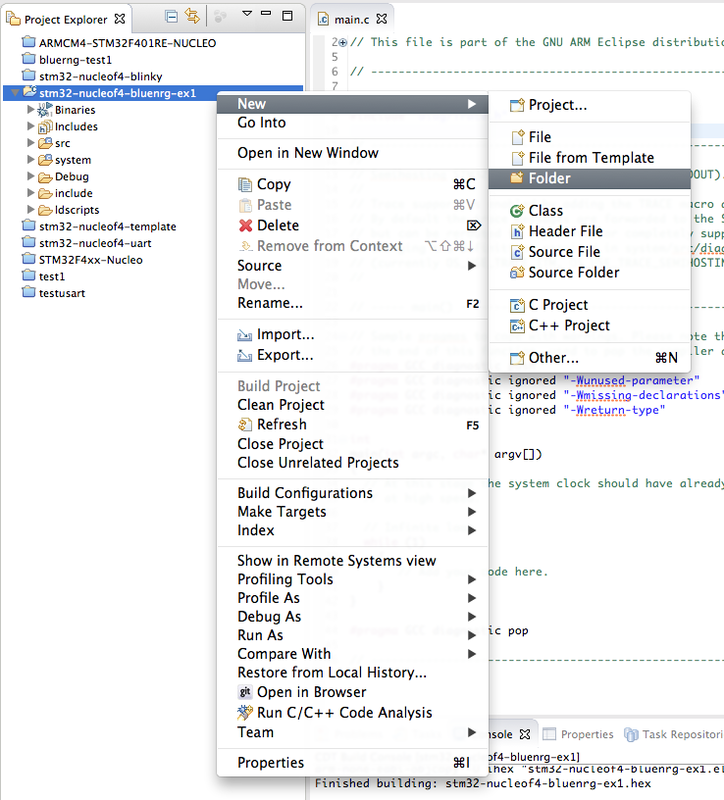 Now we need to import in the Eclipse project all the necessary files and configure the project accordingly. 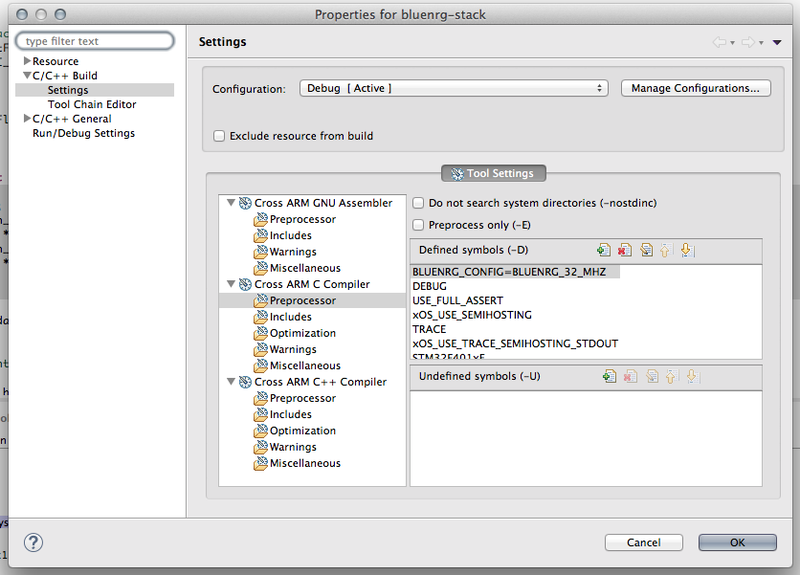 First, create a folder in the Eclipse project, as shown in the following image, and name it bluenrg-stack. 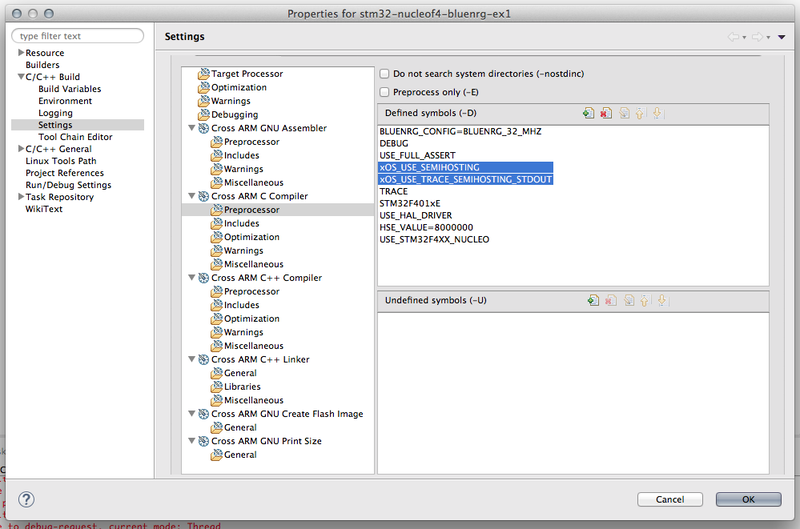 Next, create a subfolder inside the bluenrg-stack folder and name it BSP. 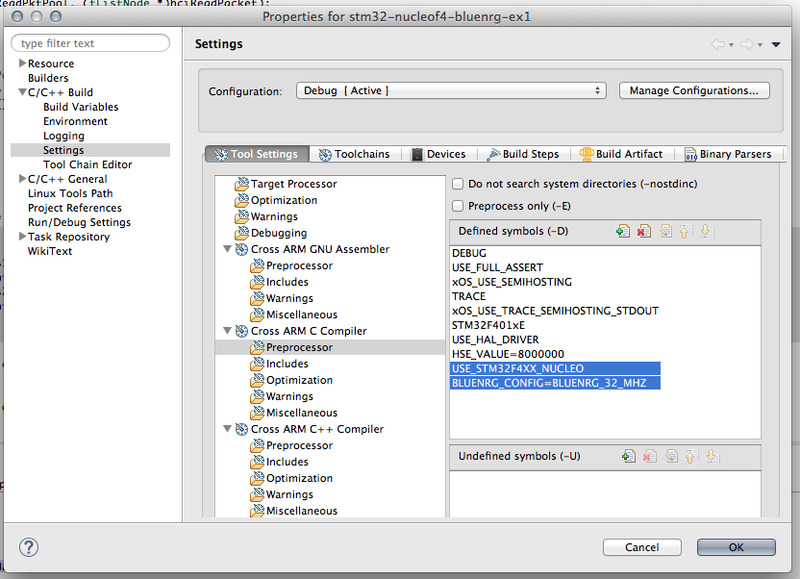 Now go inside the C:\STM32Toolchain\X-CUBE-BLE1\Drivers\BSP folder and drag the folders STM32F4xx-Nucleo and X-NUCLEO-IDB04A1 inside the BSP folder we made in Eclipse (you can find a video in the bottom of this page which shows the whole import process). 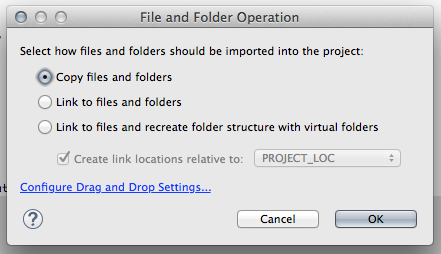 Eclipse will show a dialog that ask you how to import files and folders in Eclipse: choose "Copy files and folder". 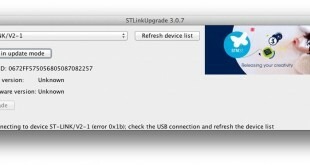 For the sake of completeness, I've to say that the best option is to choose "Link to files and folders", because if ST releases a new version of the software package, you should only replace the whole software folder in C:\STM32Toolchain without changing the project content and structure. However, this other option complicates a bit the project building process. I suggest you to try this other import option when you successfully compile the test project. It should be straightforward for you to rearrange the project settings. Ok. Now we need to instruct Eclipse to compile the files we've added to the project. By default, Eclipse doesn't compile the files we import in the project. To enable compilation, click with the right mouse button on the bluenrg-stack folder in Project Explorer panel and choose Properties. Now go to C/C++ Build->Settings and UNCHECK "Exclude resource from build", as shown below. In the same way, we have to enable compilation of stm32f4xx_hal_spi.c file (by default, GCC ARM plugin disables unused file to speed up project compilation). Go in the Eclipse folder system/src/stm32f4-hal; click on stm32f4xx_hal_spi.c file; choose "Properties" and in C/C++ Build->Settings UNCHECK "Exclude resource from build". Ok. The most of the work is done. We only need to configure the test project adding few macro definitions and adding some paths to include directive. You can now build the test project and upload it using OpenOCD (do not forget to create the Debug Configuration as shown in my series about Eclipse/GCC toolchain). To test the application you need a dedicated app provided by ST both for iOS and Android devices. The app name is "BlueNRG" and you can find it in the Apple App Store and Google Play Store. 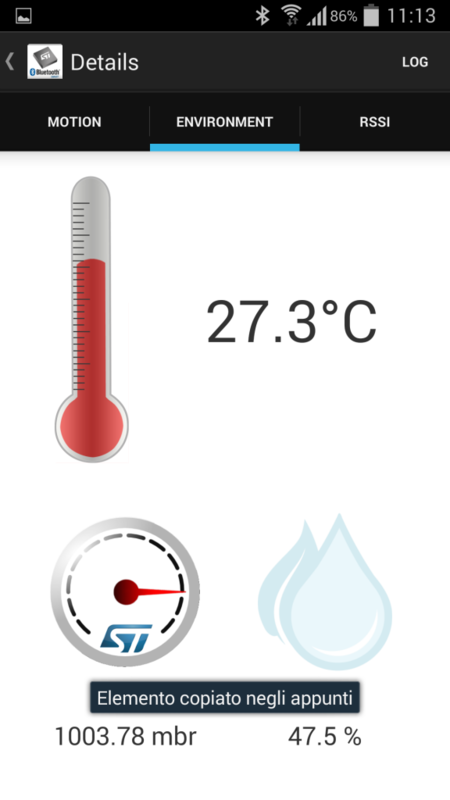 The demo app is nothing more than a simulation of a giroscopic sensor, a temperature and humidity sensor. Please, take note that it's just a demo and data are not real. As said before in this post, the example demo uses ARM Semihosting to print messages on the OpenOCD console. You can see these messages going in the OpenOCD console in Eclipse. 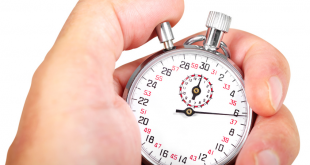 Another important aspect to clarify is that different from other tutorials we have seen in the past, this time we didn't changed the clock configuration in __initialize_hardware.c file, because the example demo already provide a correct clock configuration for Nucleo-F4 inside the cube_hal_f4.c file. This means that you have to modify the content of SystemClock_Config(void) function in that file to properly match your Nucleo oscillator settings (maybe using STCubeMX tool). Finally, you'll see a lot of warning during the compilation process. This happens due some macro defined in the BlueNRG package that are already defined in the code generated by the GNU ARM Eclipse plug-in. You can safely ignore them. As usual, you can download the whole test project from my Github repository. I also made a video that shows the whole import and configuration process. I try to use the BlueNRG shield with STM32L125RE but until now, it doesn't work. I have a question about SERVER_BDADDR, I have to change this adress ? I must put the adress of my shield ? Could you explain more in details how you succeed to run correctly the SensorDemo without launching a debug session with OpenOCD please ? 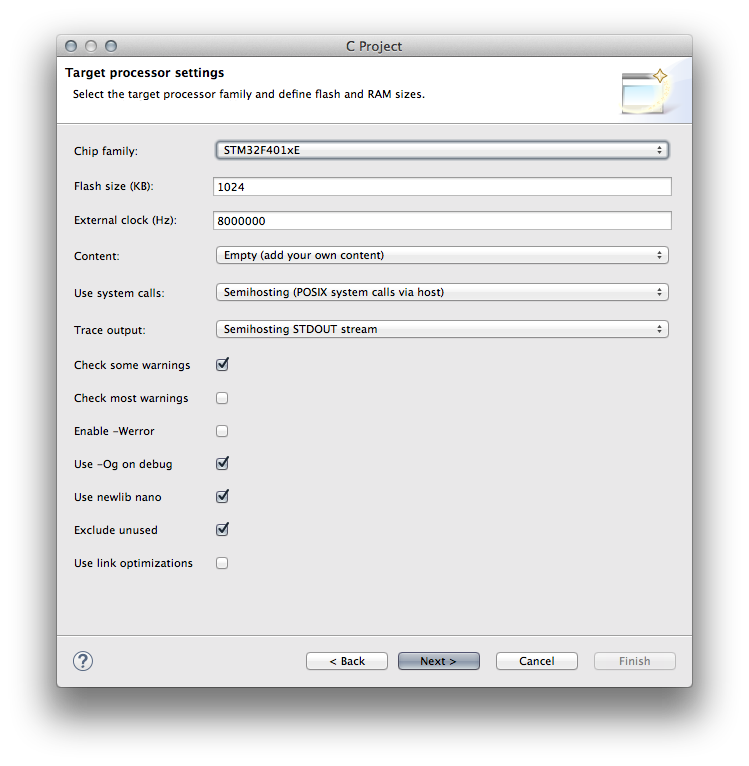 The sample app from ST relies on ARM semihosting to printout debug messages during application startup. Those print() messages are blocking if you are not using a debugger with semihosting capabilities like OpenOCD. So, you have to remove (or "add a char" that change them) OS_USE_SEMIHOSTING and OS_USE_TRACE_SEMIHOSTING_STDOUT from the project configuration if you are not running OpenOCD. However, I suggest you to setup OpenOCD and to do a debug of the application, otherwise is really difficult to understand what's happening. But, what about your board? Is it a nucleo or what? What kind of nucleo? We are working with a NUCLEOF411 and NUCLEOF401 (we adapt the LD script in the linking step). My goal is to import the whole project architecture in Linux and compile/link/flash with an arm-none-eabi toolchain of course. I use SCons, it's like Makefile but based on a Python script, to compile and to link. And I flash the board with st-link (st-flash, st-util+arm-none-eabi-gdb for debug). I added the "ghost char" in the two flags but it doesn't make any different. Unfortunately, without a live debugging on the board is hard to say what's wrong. I suggest to spend some time to setup OpenOCD (it should be really simple on Linux) and try to perform a step-by-step debug on the board. I'm looking into mbed solution for better handling ability. My instructions are based on the X-CUBE-BLE1, not the OSXSmartConnPS low-power profile. In that package you'll find all files you need. I am trying to use this shield with an Nucleo L0. Do you have any steps for setting up the eclipse IDE for this CubeL0? 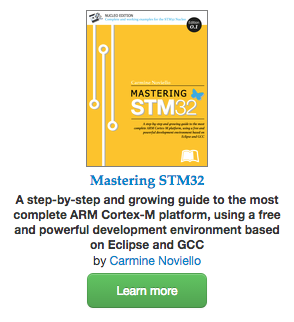 Download the free sample of this book about STM32 programming and follow the instructions to setup the whole toolchain. 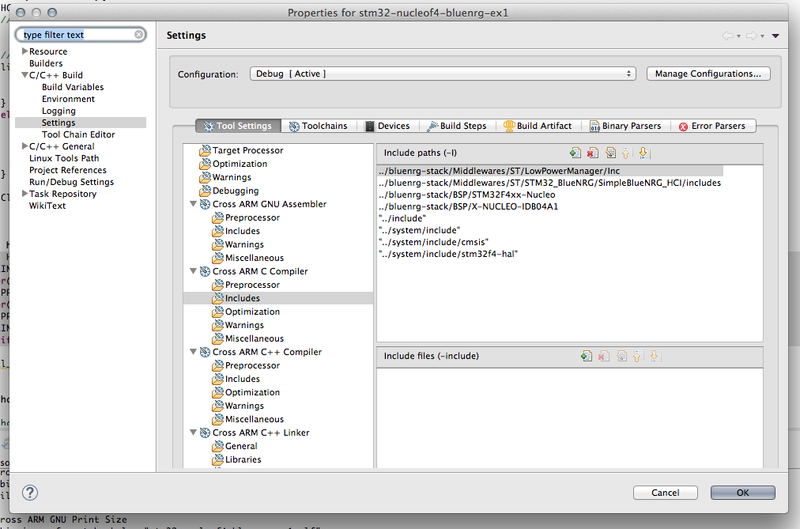 Next, follow this tutorial on how to import CubeMX projects in Eclipse, or use this other tool to import it automatically. do you have sample code to do 1-Master-Multiple-Slave connection and packet transmission, mainly from slave to master through indication? In this case, master is the Nucleo board with BLE as well. I am struggling to find sample code to achieve it. The latest BlueNRG GUI app from STM has sample Python code to do 1-Master-Multiple-Slave connection and packet transmission through notification. However, I found the packet loss is significant (>10%). I wonder if indication is better; or there is other much better way. 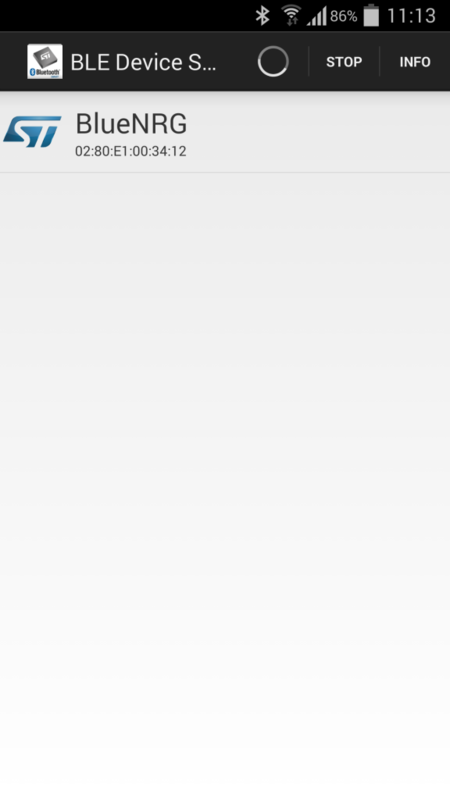 Unfortunately I've never worked with this IDE. 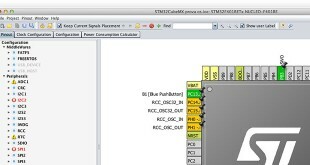 I have a nucleof411re, and I want to make the project named "Profiles_LowPower" from STM32CubeExpansion_BLE1_V3.2.0 in eclipse just like you in this article. I cant build the project, every time I get error messages. The project works fine with keil, and I added the same files in eclipse. Can you make me a short description, how to make this project in eclipse? Thank you in advance for your help! PS: I bought your book and I really like it, it's very useful. I am trying to test the BLE Profiles application mixing X CUBE BLE1 with CubeMX. 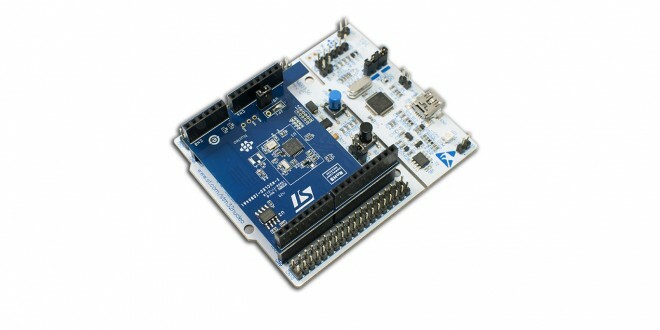 I am using a STM32 Nucleo 144 board NUCLEO L4R5ZI with the X NUCLEO IDB05A1 expansion. This is taking me a lot of effort! Looking forward to your repply.